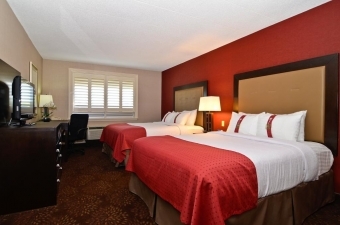 With 181 well-appointed, newly-renovated guestrooms, they cater to single business travelers, families looking for leisure, and everything in between! All rooms come with free WiFi, and guests are encouraged to take advantage of deluxe rooms featuring suites with a full kitchen and jacuzzi. Enjoy an extensive list of first-class amenities including a heated saltwater indoor pool, fitness centre, onsite restaurant, entertainment centre and rooftop patio. Plus, onsite is their 20,000 sq ft conference centre - St. Catharines' largest convention centre for events, meetings or weddings! Ask about their all-inclusive meeting or wedding packages today!